A blast from the past. 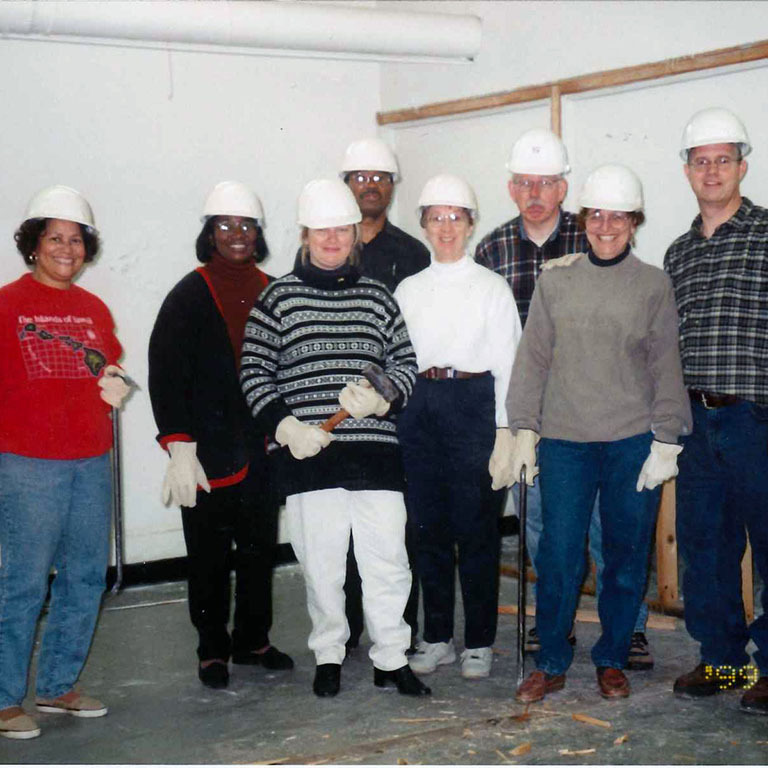 IUPUI staff and faculty participate in the annual United Way Day of Caring in 1999. IUPUI has emphasized civic engagement and service for the Indianapolis community, with particular attention toward educationally meaningful service, for decades. Documentation of this campuswide value dates back to the 1980s. Campus development plans from 1988 identified IUPUI’s unique position as the only public college or university in the state’s urban center and capital, and the plans explained the focus of service in IUPUI’s mission. Today, the Center for Service and Learning (CSL) serves as the main link between IUPUI community members and service-related opportunities. The university’s strong commitment to civic engagement is evidenced across the campus and includes supporting faculty in scholarly work related to civic engagement, promoting educational practices that prepare graduates for facing issues in their communities, developing programs that emphasize civic engagement, and assessing the effects of these efforts on student learning and engagement. It isn’t about just serving to learn or doing to learn. . . . It’s also about learning to serve and enhancing the civic development and social understanding of college students. In 1993, the Office of Service Learning was established to encourage and to support community involvement of faculty and students tied to educational elements. Service learning was defined as a course-based educational experience where students participated in a service activity meeting a community-identified need, followed by a reflection, to understand the need itself and the service provided. Dr. Robert Bringle served with Dr. Julie Hatcher as leadership for the office, first focusing on creating service learning courses for the campus. A year after the creation of the Office of Service Learning, the office’s leadership established the Community Service Scholarship program, now known as the Sam H. Jones Community Service Scholarship program. This program was named in honor of community leader and advocate Sam H. Jones. With over 150 scholars across 10 program sectors, it is now one of the largest campus-funded service-based scholarship programs in the country. The mission of the scholarship program is to recognize students for their academic achievement and service to the campus or community and to support the continued involvement of students who participate in educationally meaningful service in the Indianapolis community. 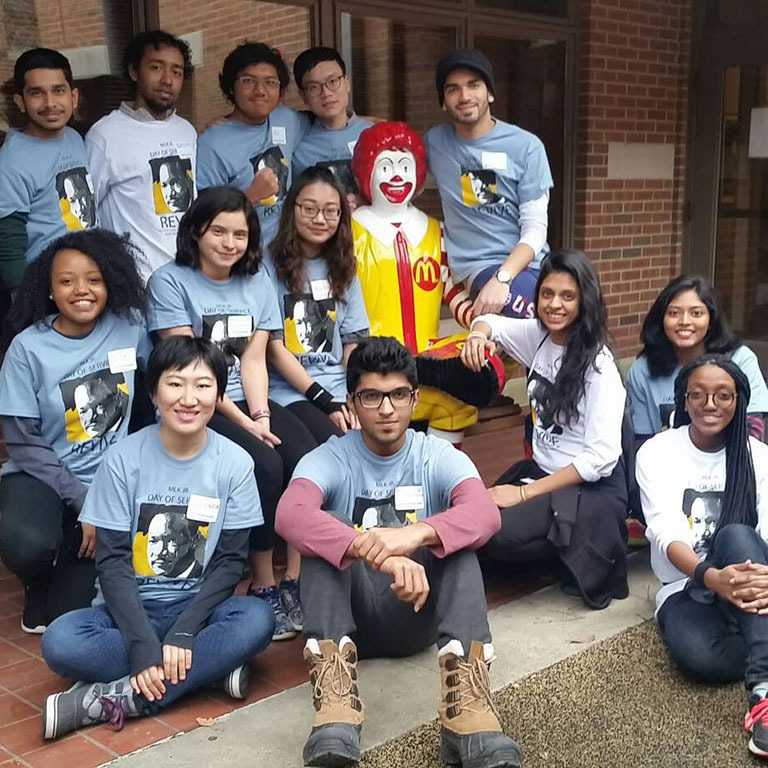 Students volunteer at the Ronald McDonald House for Day of Service 2017 on Martin Luther King Jr. Day. 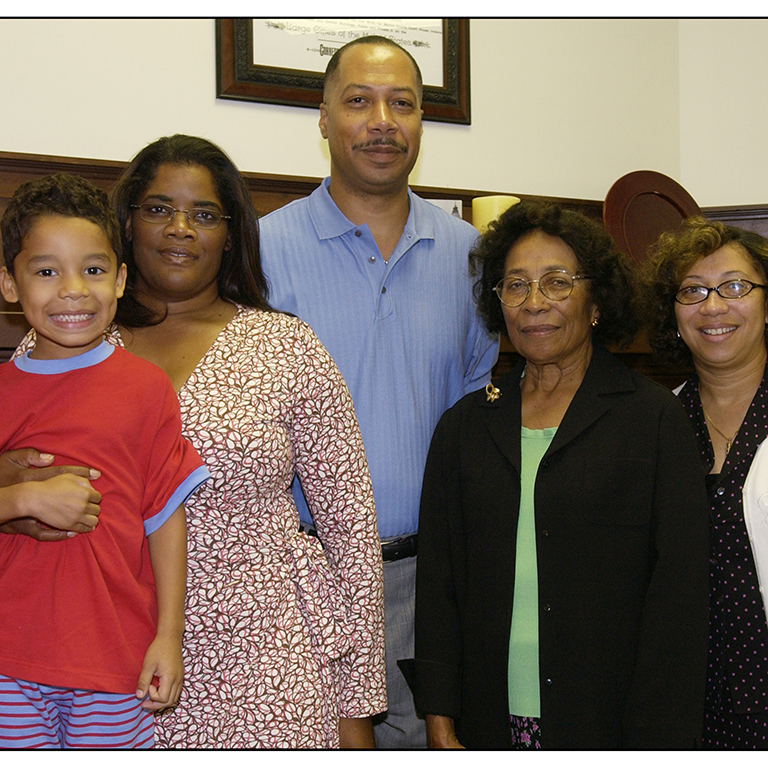 Sam Jones's family at the 2005 Sam Jones scholarship luncheon. 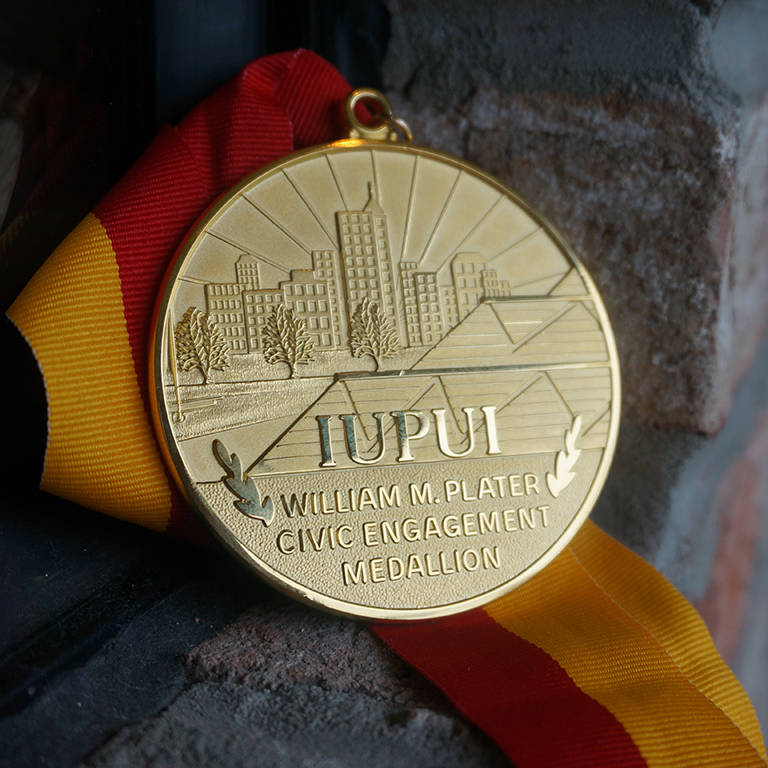 The William M. Plater Civic Engagement Medallion was established in 2006 to honor graduates who excelled in their commitment to the community through service learning, volunteerism, community/social issue advocacy, community work-study, and political engagement. 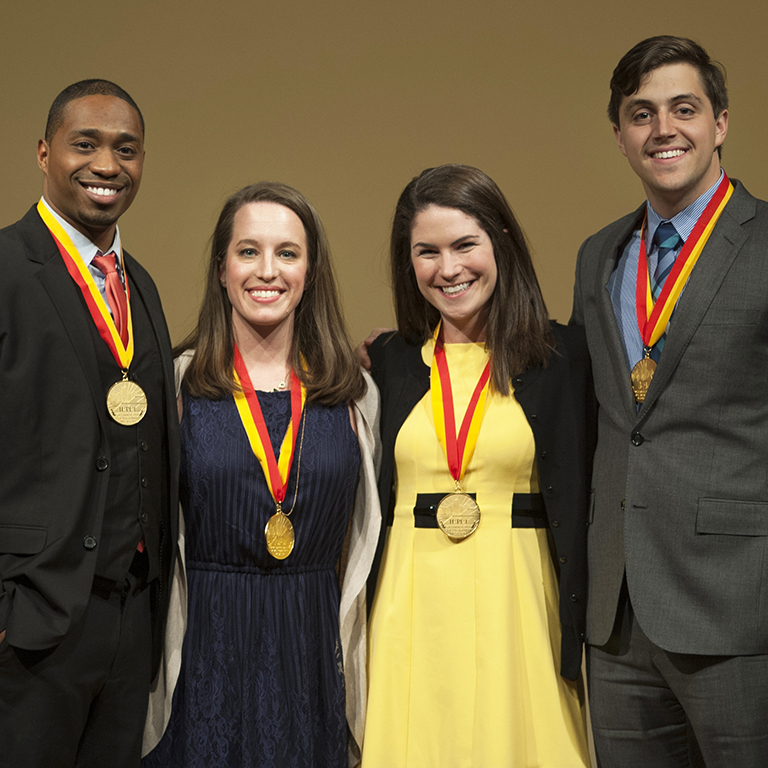 2016 William Plater Civic Engagement Medallion recipients. 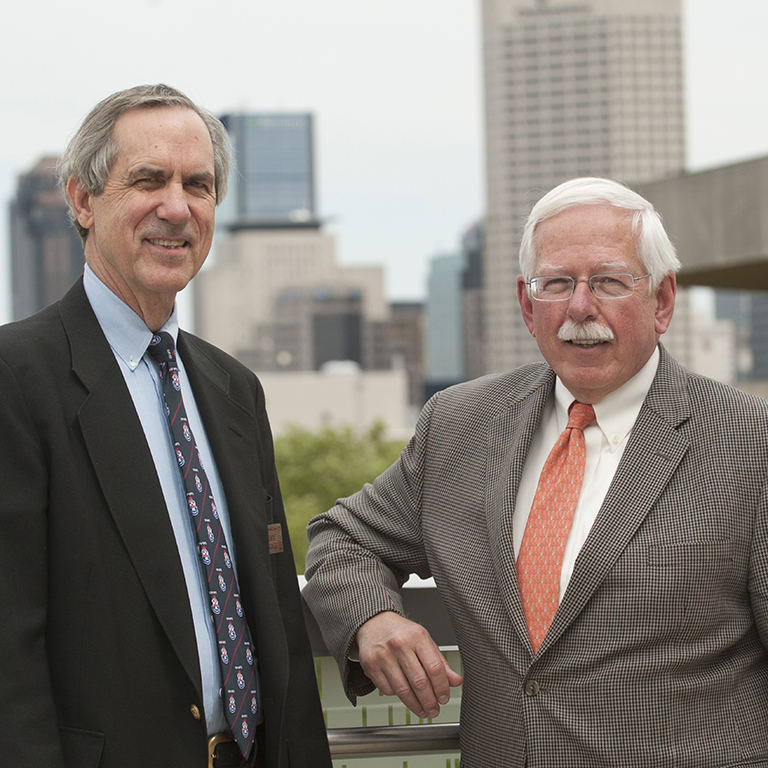 Dr. Robert Bringle with Dr. William Plater at the annual IUPUI Robert G. Bringle Civic Engagement Showcase in 2012. Dr. Bringle and Dr. Plater served as leadership for the Office of Service and Learning, and Dr. Plater played a pivotal role in leading campus efforts to strengthen civic engagement. Coinciding with the Sam H. Jones scholarship program, the Office of Service Learning began a partnership with the United Way Foundation to host the first annual United Way Day of Caring in 1994. This was the first campuswide service event at IUPUI. Day of Caring has since expanded, engaging around 350 IUPUI community members annually at volunteer sites around the city. In the 2000s, large-scale service events expanded to include the Martin Luther King Jr. Day of Service and César Chávez Day of Service, which occur every January and March respectively. In more recent years, SECRET Service Day was added to provide an opportunity specifically for first-year students to get engaged and to connect them with other students who are passionate about voluntary service. The center’s 2016–2017 annual report indicated that more than 1,000 students, faculty, and staff participated in these four service events, providing the community with 6,462 hours of service at 46 sites around Indianapolis. Research on developing service learning programs conducted on campus has been recognized nationally and has culminated in a four-part book series and ScholarWorks database. Following CSL’s expansion of service programs and research, U.S. News & World Report recognized IUPUI for its excellence in service learning programs in 2002. Each year since then, IUPUI has continued to be recognized in the publication’s America’s Best Colleges edition. Our emphasis on research has always set us apart from other people doing this work and has been a key contribution to the field. Faculty research on the impact and best practices for service learning curriculum has lead to a vast expansion of service learning courses on campus. As of 2013, IUPUI students could choose from more than 500 courses that integrate service learning, which means students are not only serving the community but they are also connecting their experiences back to their fields of study. Another signature approach to engaging faculty on campus is the faculty learning communities organized via the Center for Service and Learning. A group of faculty members work together to develop research and understanding on a particular topic for up to three years. Past community topics have included student themed learning communities and best practices for service learning courses. Participants meet on a monthly basis, share common readings, and take action to implement what they have learned, such as altering course curriculum to improve the students’ experience. IUPUI’s commitment to community involvement has continued into recent years. In 2014, Chancellor Nasser H. Paydar led a strategic planning initiative for the campus, which included a goal for “deepening campus commitment to community engagement.” The Office of Community Engagement, designed to develop a strategic approach to community engagement, was also established four years ago. The long-standing commitment IUPUI has shown toward civic engagement makes the future of related programs promising. As CSL celebrates its 25th anniversary, those involved with service learning and civic engagement at IUPUI envision further integration of service and civic-mindedness into the average student’s college experience.